These universal racks can accommodate both the core and coreless 50 yd resistive exercise bands and all 6 yd bands. 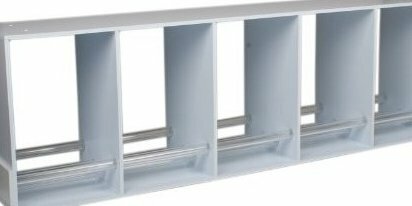 The universal tube rack comes with an easy loading mechanism to facilitate wrapping of resistive exercise tubing onto the dispensing spindles. Racks come with a shelf for additional convenience. Lightweight stackable and horizontal rack. Universal resistive exercise band and tubing 5 section rack.